Hello friends! Well this post is a little later in the day than my normal posting time, but yesterday we headed out to the Texas Renaissance Festival and I was so tired when we got home. The festival was so fun!! We ate yummy food like potato pancakes, watched some comedy shows, and attended a jousting event. Then there is also the people watching. Lots of people dress up in Renaissance attire, and I LOVE checking out all the costumes. Ya’ll people go ALL out for this festival! It’s so fun to see. Anyway, it was sunny and hot, and after all day outside, well last night I was too tired to give this post the attention it deserved. I love playing with different beauty products, so a Christmas Gift Guide for Beauty Lovers is always a favorite of mine to put together. Many of the products featured are brands or exact products I have used and recommend. A few are brands that I have heard rave reviews over and kind of want to try out myself. My favorite section of this guide is the Spa Day section. All 3 of these items paired with a nice bottle of wine is the perfect gift for anyone, beauty lover or not. I mean you can’t go wrong with the gift of relaxation. Also, I think this is the most adorable eye mask ever! It comes in a few different color combos too. One of my favorite products in the guide is the eyebrow powder. I received mine in a press kit, and it was life-changing. I had been wanting a product to help fill in sparse areas of my brows, but I didn’t need anything to dramatic. The overall shape was fine, so I just needed something simple. This product takes me less than 30 seconds to apply. I simply use it to slightly darken and fill in my brows. I feel like it gives a natural look. I’m wearing it in all my blog photos lately if you want to check it out in action. Let’s talk about a few brands I love on the guide. Majority of my makeup brushes are by Sigma Beauty. I purchased them last year on Black Friday. They still look and feel new, so I highly recommend if you know someone in need a few new brushes or looking to start a brush set. The Cosmedix mask is on of my current favorites. It leaves my skin baby smooth after I use it. It’s one of my top masks for soft, smooth skin. Also, I double cleanse my skin and this little balm and mit duo have been a fun addition to my night routine. Plus, I like that I’m not throwing away all those little wipes every night. Kiehl’s is one brand that I constantly circle back too. The kit I found includes my two favorite products from them – the face wash and Midnight Recovery Oil. Another brand highlight is Aveda. I’ve been using this lineup for a few months, and my hair is definitely healthier than when I started. Multiple items in my guide are gift sets. Gift sets are great if you don’t really know a person’s favorite brand preference or beauty items. Sephora makes some sets that cross multiple brands. If you know a brand they love or want to try, buy a sampler set. I think skincare is always a safe bet, because I think it reaches a broader audience than say a brush set. 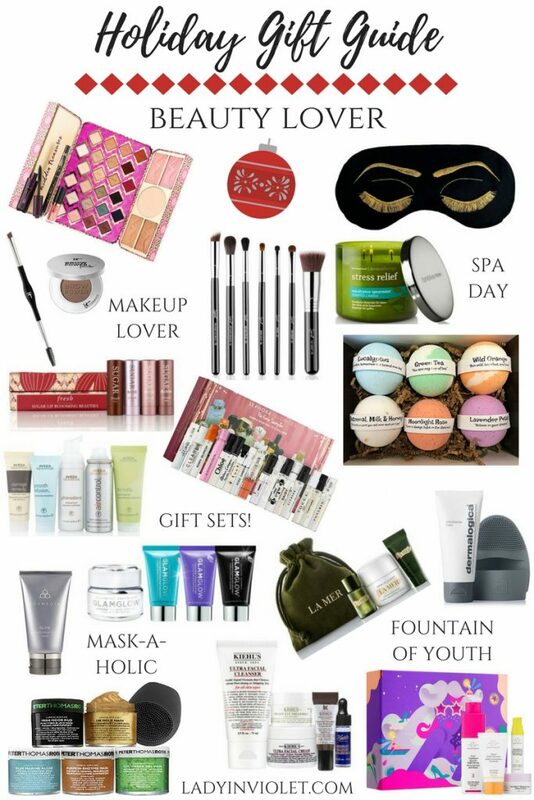 Well thanks for taking some time out of your weekend to check out some of my top beauty gifts of the season. Don’t forget you can find more ideas under my Holiday Shop page. I’m currently working on more in depth reviews of some of these products too, so check back for those soon. Ya’ll have a fabulous day! Hello sweet friends! How was your weekend?? I launched my Holiday Gift Guide Series on Sunday, sharing a few gift ideas under $50. You can check it out here! I’m hoping to start posting an extra time each week, time permitting. So if you are bored on Sunday or want something to peruse, you can pop on over and see if I have anything going on. I have some fun post ideas in the works. Okay, how perfect would this rust colored asymmetrical sweater be for Thanksgiving!! The color just screams fall and Thanksgiving. The asymmetrical design of the hem really caught my eye, because it was a little different than your average crew neck ribbed sweater. One feature I really like is the slits on the sleeves. I love my sleeves to be a bit on the longer side, and the slits help keep the sleeves out of your way when using your hands. I need to find more sweaters like this ASAP! Don’t forget it’s Style File Link Up Day! Scroll on down to share your latest outfit post or to find more holiday outfit ideas! Thanks for stopping by ya’ll! Well I officially kicked off my Christmas gift shopping this week at the Nutcracker Market and purchased my first of many gifts. I figured that probably meant it was time to kick off the Holiday Gift Guide Series here on the blog. I have a few guide ideas for this season, but feel free to drop a comment of any gift ideas you are needing help with. I love kicking off my gift guides with Christmas Gift Ideas under $50. I feel like it’s the price range that hits that sweet spot for most of your gifting needs. The gifts featured range from $25-50, and cover an array of ideas from favorite beauty sets to winter must haves and a few ideas for the home. A few items featured are things I own, love, and highly recommend. We converted to this electric wine opener this year after our manual rabbit broke. Ya’ll I’m obsessed with this opener. It’s so easy to use, and this one comes with a few extra wine tools. Body Shop Body Butter is one of my favorite body lotions. I received a large one last Christmas, and I love how soft and hydrated it leaves my skin. I will probably be adding this little sampler set to my wish list, so I can try ALL the scents out. Also, I have to talk about this nail polish. It’s pricey, but it still looks good a week later. I’m planning to put a holiday set or two of this brand on my list. You can also buy the set and give each bottle out as stocking stuffers. If you are looking for a classic jewelry piece, I wear this necklace weekly. I always recommend it as a gift idea for women of all ages. It’s a classic style and good price. It comes in a few color options too, so you can pick out their favorite color or go with a neutral white stone. I own this necklace in rose gold and silver drusy, that’s how much I love it. Also, ya’ll how adorable is this electric tea kettle! It’s perfect for someone who loves herbal tea, and I think it would look so cute on a kitchen counter. It comes in a few other colors too. The blog received its official holiday update this weekend. The Holiday Shop is officially open and added to the menu bar. The shop is filled with gift ideas for him and her in an array of price ranges. I’ll be updating these all shopping season as I find some of the best holiday gifts on the web, so be sure to bookmark for when you need some gift ideas. Thanks for stopping by ya’ll and Happy Holiday Shopping!